Hornady’s Interlock bullet technology has revolutionized hunting for whitetail deer. This devastating technology features exposed lead-tipped bullets, allowing for controlled expansion and powerful performance. The exclusive Interlock ring is a raised ring, inside the jacket, that keeps the core and jacket together during expansion. This means more mass and energy on impact, making for a more effective one-shot deer round. 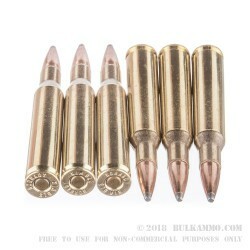 These .270 Winchester American Whitetail rounds come equipped with a 140-grain bullet in boxer-primed, non-corrosive, reloadable brass cases. 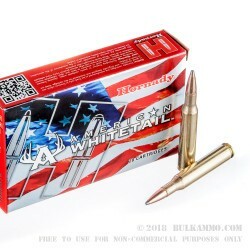 Loaded to the stringent standards of Hornady for feeding, ejection and accuracy, the American Whitetail .270 Winchester is the perfect tool to bag that monster buck this season. 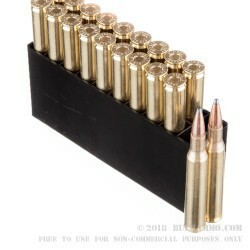 Twenty cartridges of .270 Win American Whitetail come in each box.